bankmecu had 353 employees filling 315 full time equivalent (FTE) roles at 30 June 2014. This does not include Directors or those on workers compensation. Almost half our staff were in customer services (47.9%), followed by other staff (15.6%) and clerical staff (13.6%). Almost 90% of staff members were based in Victoria. Our workforce was predominantly female, with 251 females of the total 353 employees. Most staff worked full time (76.2%) with others working part time (20.4%), casually (1.4%) and on contract (2.0%). All but one of our part time staff were female. The staff turnover rate was 9.8% in 2014, down from 10.4% in 2013. The majority of staff who left were females (70%). Most turnover occurred in metropolitan Melbourne (32%), followed by Gippsland (27%), western Victoria (20%) and interstate areas (20%). Older employees aged 51 years or older accounted for 43% of staff turnover, followed by those aged 31–50 years (30%) and those aged 18–30 years (27%). The majority of staff who left bankmecu resigned from their roles. We survey staff each year, to gauge their satisfaction and commitment to the Bank. Staff satisfaction was 86%, compared with 84% in 2013. Staff commitment to the Bank also rose to 87% from 86% in 2013. Our annual staff performance review identifies professional and personal development needs for staff; we address these needs through on-the-job and external training. We spent $263,653 on employee training and development in 2014, or $837 per FTE. On average, each FTE staff member received 67.77 hours of training and development, up from 40.96 hours in 2013. Almost 80% of staff were satisfied with the level of training they received and 75% reported the training program further developed their skills and abilities. bankmecu reviews salaries annually, to ensure they are competitive with banking industry standards, using a range of external benchmarks including the Australasian Mutuals Institute Salary Survey. The Managing Director reviews the executive team salaries against an agreed set of performance outcomes including external sustainable development commitments, and then makes recommendations to the Board via the Governance Committee. All staff are eligible for a salary increase following their annual review, depending on individual performance and budget constraints. Managers and executives do not receive bonuses. Staff at lower levels can receive incentives, which are determined through the annual employee performance review process and are subject to budget constraints. Average salaries ranged from $54,939 a year for customer services staff, to $383,213 for executive staff. 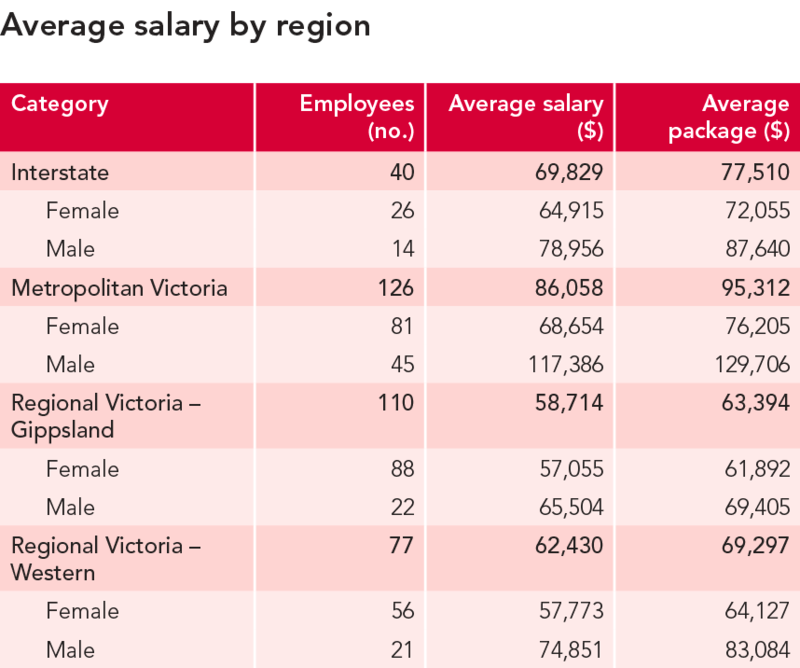 Average salaries by region varied from $58,714 for staff in Gippsland to $86,058 for staff in metropolitan Melbourne. Average male salaries were higher than female salaries at each level. 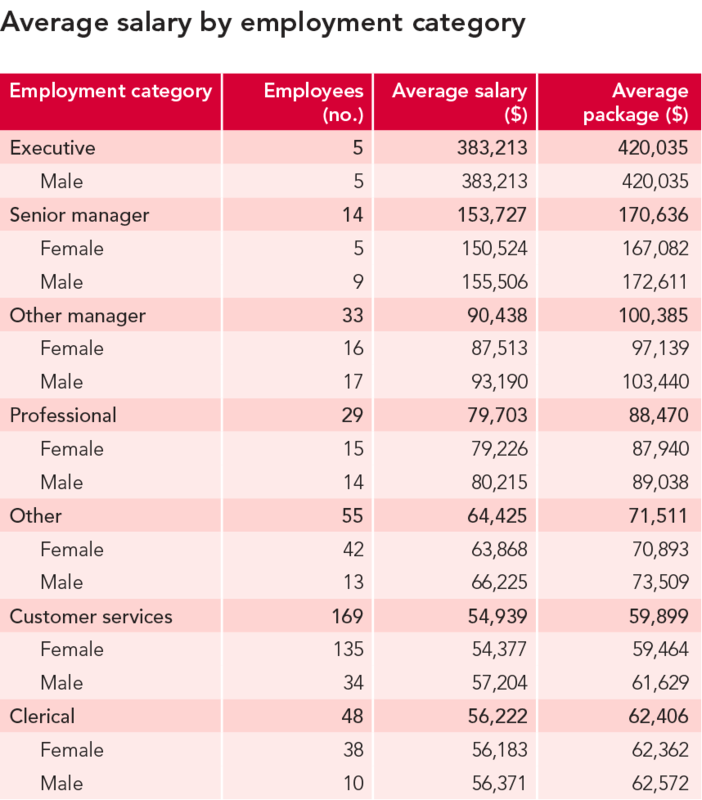 The difference between male and female salaries reflected how roles are categorised, levels of experience and length of service. In 2014 71% of staff were satisfied with their remuneration over the past year, 16% were neutral and 13% were unsatisfied with their remuneration. Board remuneration is reported under Governance and in item 5 of the Statutory Accounts. Parental leave. Fifteen employees started parental leave, comprising nine females and six males. Seventeen staff (11 females and six males) on parental leave returned to work out of 18 due to return, representing a return to work rate of 94%. This is lower than the rate in 2013, when all 15 staff on leave returned. Further, 12 of these staff (80%) were still with us 12 months later. Absentee rate. Our absentee rate was 3.6%. Most absences were recorded in metropolitan Melbourne (37%) and Gippsland (32%). Occupational health and safety (OHS). We recorded 14 OHS incidents and four injuries. Only one injury resulted in lost days (2.43 days). bankmecu has a recognition program that acknowledges and rewards staff who go beyond ‘business as usual’ by demonstrating their commitment to sustainable development. Our Superstar Awards are funded by Allianz Australia Insurance Limited. The six winners this year visited the Conservation Landbank, our private nature reserve, and attended the Wimmera Biodiversity Seminar in September 2013. This recognition program reinforces the fact that 94% of staff support the Bank’s commitment to sustainable development.